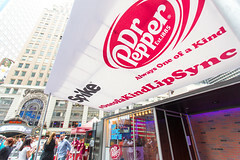 Working with Civic Entertainment Group we hit Times Square for the second time with the Spike Lip Sync Battle Booth, this time teaming up with Dr. Pepper. 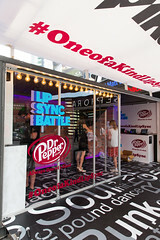 Using the hashtag #OneofaKindLipSync, Dr. Pepper invited some of the biggest Vine stars and social media influencers to Times Square to take part in the challenge promoting new episodes of the Lip Sync Battle series premiering on July 9. 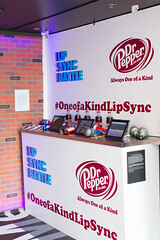 With internet sensations like Liane V, Hannah Stocking, and Louis Giordano sharing the event in their social media channels, crowds began to form in times square to get a chance to meet their favorite celebrities and participate in the #OneofaKindLipSync contest, where participants enter our Lip Sync Battle Booth built from a modified 20′ shipping container. 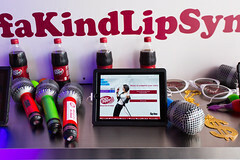 Inside contestants choose one of four songs that they can lip sync to enter a chance to be featured on an upcoming episode and win VIP tickets to a studio taping. The ‘performances’ are displayed on one of the Times Square jumbotrons, and a few of them were livestreamed on Periscope and Snapchat. The contest continues through July 5th, so if you want to flex your lip sync skills, you can enter here. 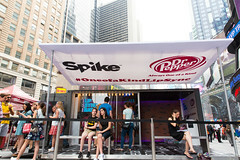 And thanks to Civic, Spike, and Dr. Pepper for the opportunity to be part of such an awesome activation. We can’t wait to do it again!